performing at Isey's Supper Club. mimeographed survey like the one opposite. . I was thirteen years old in 1962 and an avid listener of Red Robinson's Platter Party on CKWX. What I have written here is based in part on on my memories and perceptions as a young listener from that time period, and is not based on any solid information acquired from within the radio industry. If I remember correctly, the date would have been March 16, 1962, on a Friday night just a few seconds before midnight. I was listening at the very moment when Red spoke his last words as a DJ on WX saying something like, "This is the Platter Party signing off . . . forever." The Fabulous Forty survey had already been discontinued two weeks earlier. Red had continued on, occasionally mentioning on air that the station no longer had a survey, although he sometimes referred to a song's position on one of the national charts. With Red's final words CKWX had completed its gradual exit from the Rock/Pop format to the Middle-of-Road format. There was no fanfare or even any acknowledgment of the change, and one might wonder if anyone even noticed the passing of Top 40 from WX. 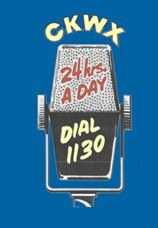 It had begun the previous Fall when the morning time slot occupied by Woodman and Rich, was supplanted by Vancouver's first "open line" or "talk" show with Barrie Clark (who had previoulsy worked for WX as a DJ.) Further changes in the music came early in the new year which found DJs Buddy Clyde, Del Erickson and Nick Sands, playing M-O-R music, as was Cal George--a WX stalwart who had been at the station for many years prior to the start of "Top Forty" back in 57, and would be there for another five years--and who simply carried on in a format he was probably more comfortable with anyway. All this left Red as the only remaining Rock/Pop DJ on the station, as he first had been when he came to WX back in 57. CKWX hardly seemed to be hurting from all this. Unconfirmed ratings reports put them in the number 2 spot,second to CKNW, with CFUN third. But, while Red's Platter Party continued to be popular, the younger crowd had otherwise gone over to C-FUN. 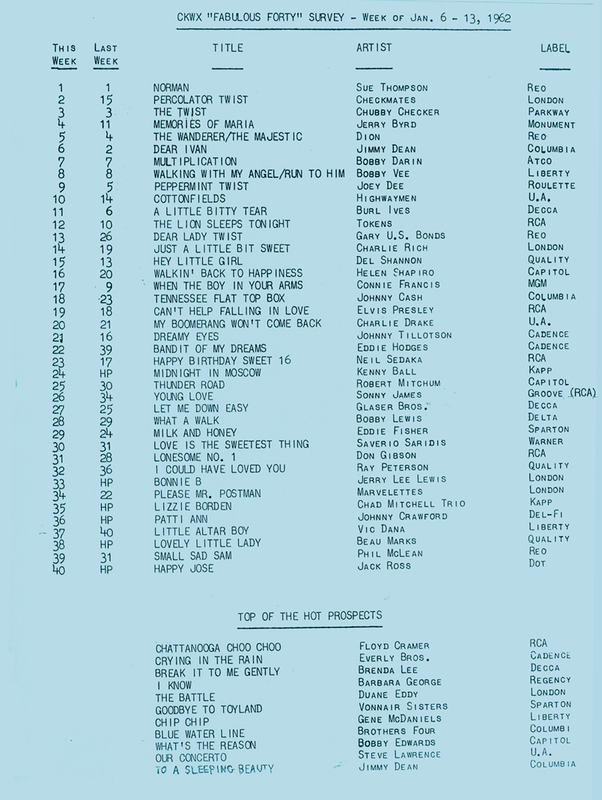 The larger WX, with its more expansive news coverage and a sports department which included Mounties baseball games and WHL Canucks hockey, both of which cut heavily into Red's broadcast time, along with the station's larger overall audience base, perhaps found itself better suited to M-O-R and that it no longer needed to be "Top Forty" anymore. Or perhaps management was miffed at taking number 2 spot to an M-O-R station. All that, and as Red Robinson told me recently, the newer management simply did not understand the dynamics of Rock and Roll. Today, when I come across a a brief history or chronology of CKWX, either on the internet or elsewhere, I find there is absolutely no mention of its years as a "Top Forty" station. And so with that I say. . .BROADCAST HISTORIANS TAKE NOTE: From 1957 to early 1962 CKWX was a "Top Forty" giant in Vancouver radio, and gave our region's younger listerners the "Sensational Sixty" and the "Fabulous Forty" along with slogans such as "stacks of wax" and "a greater measure of listening pleasure". 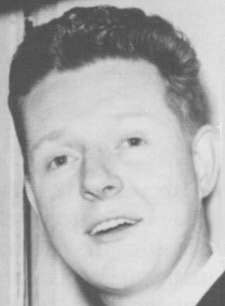 And they gave us personalities which included Red Robinson and his "Teen Canteen" and "Platter Party," and whose efforts they backed to bring Elvis to town in 1957, his first visit to Canada. And then there was the DJ with the squeeze-horn at his side--Buddy Clyde, and Del Erickson who occupied the late night slot, but who also sang and recorded local hits like "Two" and "Rockin' Band" both of which charted high on the CKWX survey. And one can only wonder what it would have been like hearing Norm Grohman, Jim Robson, and Barrie Clark, spinning Elvis records. The departure of CKWX from "Top Forty" left CFUN in total possesion of the reins, for a few years, at least. But that's another story.